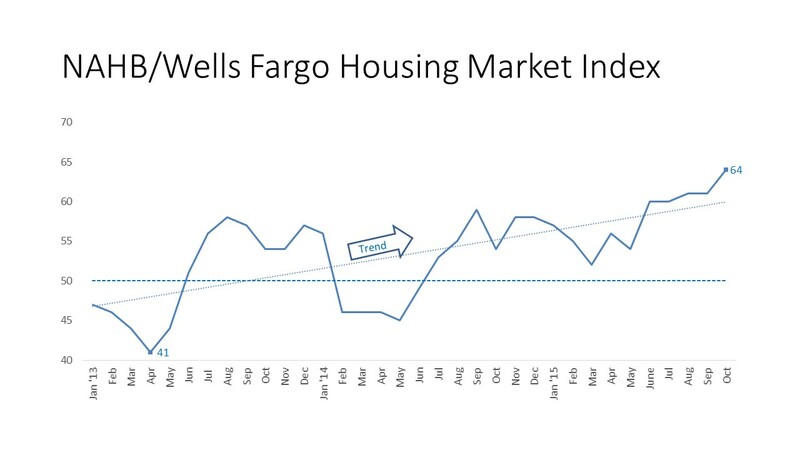 The NAHB/Wells Fargo Housing Market Index for October jumped three points from a one-point downwardly revised September. The October level of 64 conforms to levels last seen as the boom began to taper in late 2005. Even with headwinds in the supply chain, builders still report increasing consumer interest in buying a home. Customers are taking advantage of low mortgage rates and competitive prices. Any value over 50 means the majority of builders see the market getting better rather than getting worse. Two of the three components also increased. The component measuring current sales increased three points to 70 and the component gauging expected sales increased 7 points to 75 after dipping slightly in September. The traffic component remained the same at 47. Builders continue to believe the considerable pent up demand from slow movement and existing home turnover over the past 7 years is finally being released. All four regions also saw increases in their three-month moving average: the Northeast, Midwest and South increased one point to 47, 60 and 65 respectively and the West rose 5 points to 69. Concerns remain finding qualified labor and the search has caused some slowdown in production time. Good location lots are also in short supply and prices are rising, forcing builders to raise their sales prices as well. NAHB foresees continued modest growth in production even with these headwinds.